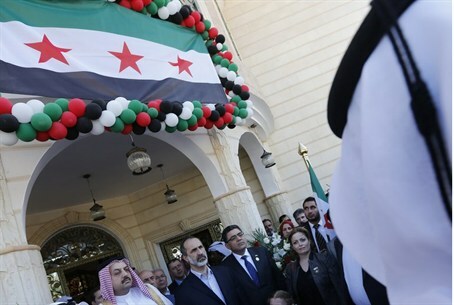 The Syrian opposition opened its first "embassy” in Qatar on Wednesday. The Syrian opposition opened its first "embassy” in Qatar on Wednesday, a day after opponents of President Bashar al-Assad were given Damascus's seat at the Arab League. Opposition chief Ahmed Moaz al-Khatib and Qatari State Minister for Foreign Affairs Khaled al-Attiya inaugurated the representative office dubbed the "Embassy of the Syrian National Coalition," AFP reported. The original Syrian embassy itself remains closed. Gulf states announced in March last year that they were closing their missions in Syria over Assad forces' crackdown on dissent that has transformed into a civil war that has killed more than 70,000 people. The opening of the mission came a day after the Arab League welcomed the Coalition to take the seat of Syria an annual summit of the 22-member bloc in Doha. In a speech addressing the leaders, Khatib said the opposition also wants to assume Syria's seat at the United Nations. "This is the first embassy of the Syrian people," said Khatib in the ceremony that saw the rebel flag raised on a villa provided by the Qatari government. Nizar Haraki, named by the coalition in February as its "ambassador" to Qatar, told AFP he would "soon" present his accreditation letter to the emir of Qatar. The coalition has named envoys in several countries, including Britain, France, Libya, Turkey and the United States, but has yet to open diplomatic missions in those countries. Qatar is the most vocal supporter of the Syrian opposition. Syria's seat at the Arab League has been vacant since the bloc suspended its membership in November 2011 after Damascus rejected an Arab proposal to end violence against protesters and continued its bloody crackdown on dissent.